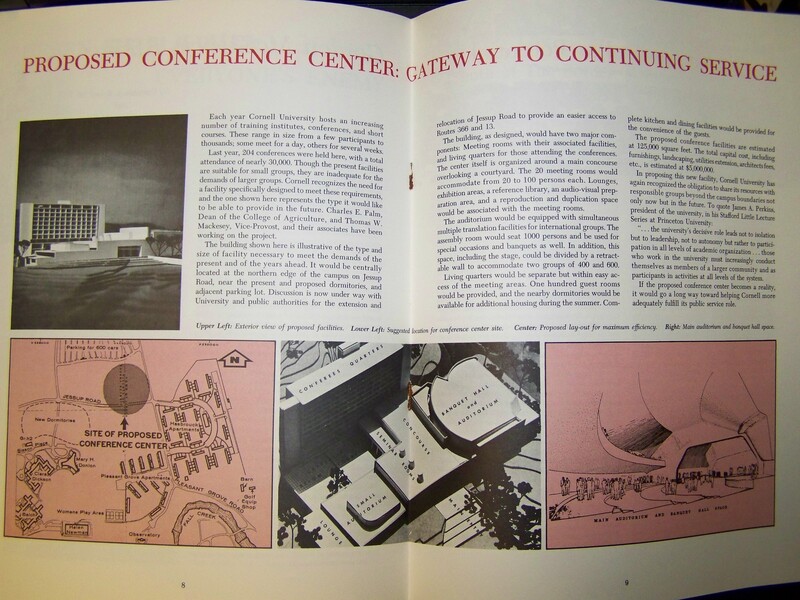 While doing research recently, I came across this an old article promoting the proposal for a campus convention center. The images and article are from a November 1966 issue of the “Cornell Countryman”, which was a monthly magazine published by the old Agriculture school (now CALS). The proposal (which was never approved), was located off of Jessup Road where the townhouses are located today. It called for a 125,000 sq ft facility complete with break-out rooms, a banquet facility and larger meeting spaces. The expected cost was around $5 million in 1966 dollars. The proposal also suggested the extension and rerouting of Jessup Road to either/or Rte 13 and 366. In the article, it mentions proposed dorms nearby. 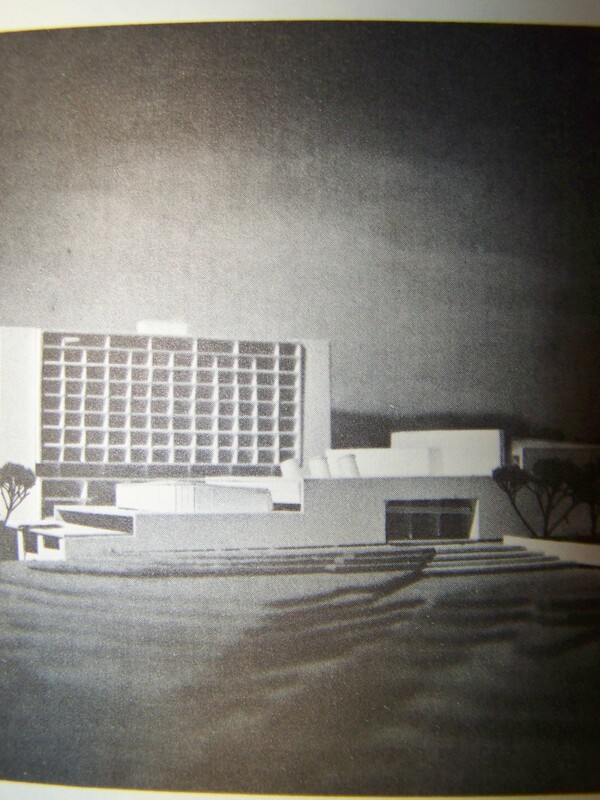 This would be in reference to the highrises and lowrises, as well as RPU, which were built in the early and mid 1970s. So, some folks might have noticed today that Bob Saget is on campus (again). Their seems to be some buzz going about as to what he’s doing far above Cayuga. “…he’s filming for his new A&E show about interesting subcultures. So the specific subculture he’s covering at Cornell is fraternities and the plan is that he will actually go through initiation. The reason why he’s in Ithaca following Seal & Serpent is that the producers approached national fraternities about filming, but the national chapters were reluctant to have their secret rituals filmed at any of their houses. The producers then decided to look at independent fraternities as they don’t have to deal with national chapters. They approached S&S (oldest independent fraternity in the country) who agreed. The producers were present at the frat’s initiation dinner a few weeks ago. Well, one of my best friends at Cornell happened to make it the topic of our lunch discussion, before I even heard Bob Saget was on campus. Originally I included how they knew so much. I removed it in case some hypersenstive brother goes on a witch hunt (ed.) Apparently, the program is paying for Seal to do a formal Friday night, tuxes, dates and all. Opinions of Seal aside, just about any fraternity (I’m not even humoring the thought of it being anything else but a normal Cornell fraternity) would love to have the cost of a formal covered. Also, though perhaps stereotypically so, the program is paying Seal to host a toga party Saturday night. I have no idea whether that is open or not. Yeah, so, congrats to Seal. I think. I’m shamelessly borrowing the idea of thesis discussion from Elie Bilmes over at Fast Lane. It’s impressive that he put as much work as he has into his government honors thesis. I figured I could write a little from my end on doing an atmospheric science thesis. The nature of the two works are entirely different. In comparing with friends of mine that have done theses in CAS, it’s nearly impossible to relate, except that a lot of work and research went into both. I started work on my thesis last August and only began formal writing at the start of March. I made it easier on myself by keeping an electronic log of progress, and my research adviser and I met for “progress reports” every week on Tuesday at 2 PM for months on end (and Heaven help me if I had nothing new to share). I came back early from Christmas because winter break and security access afforded me great deals of time to conduct research. 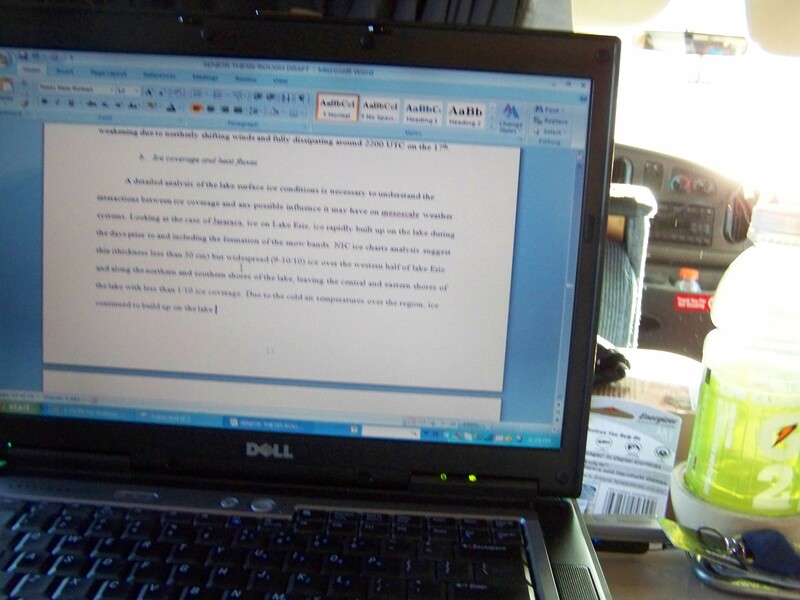 My spring break involved many hours of churning out page after page of writing, computer outputs and mathematical analyses of heat transfer through lake ice. In retrospect, I probably should’ve used LaTEX. In the end, it came out to 50 pages. That’s on the large side for a technical thesis. 20 figures with an average of two subfigures each, 31 citations, and 50 pages. It sounds pitiful when compared to an Arts and Sciences production. Yet, they’re expected to be eloquent, elucidate their ideas and produce theses that could very well be works of literary art. My work is direct, with little said beyond the point. A diagram is analyzed, discussed; a matlab graphical output is viewed for trends and diurnal effects. I dunno to what extent Elie’s work will be used beyond satisfactory completion of his honors requirements. Maybe it will be cited and referenced in future works. As for mine, I presented it at a conference this past weekend, and the faculty and researchers in attendance held my work in high regard. Well, almost all of them. One professor from another upstate school complimented my work and asked me about my grad school plans. I explained I was being funded to do work in climatology. He became very disappointed, saying it was a shame my work was going to go to waste. What a charming way to conclude my research. It’s amazing how the ideals are the same (independent thought and research) between schools and their theses, and yet the works churned out by their students can be so different in character. But, that is the nature of different fields of study. For an architecture junkie like myself, Munier Salem’s column in the Sun today was a must-read. 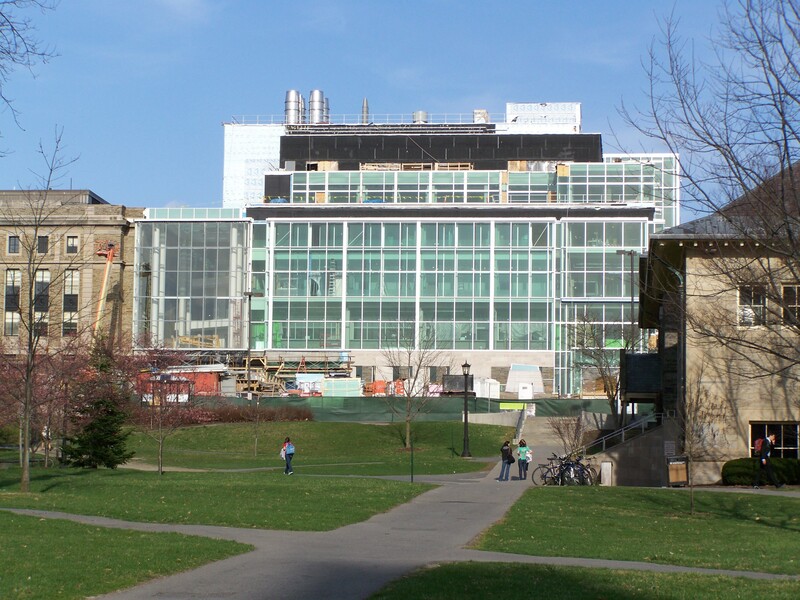 The article briefly went over the previous eras of architecture of Cornell’s campus, and then zeroes in on the Arts Quad and the perceived blight that Milstein Hall will bring to this part of campus. Not that I disagree. Well before I started this blog I can remember a long discussion about campus architecture Munier and I had in Cascadilla Hall. Munier has never hidden an opinion that almost anything built after 1955 has been either par for the course or an eyesore. 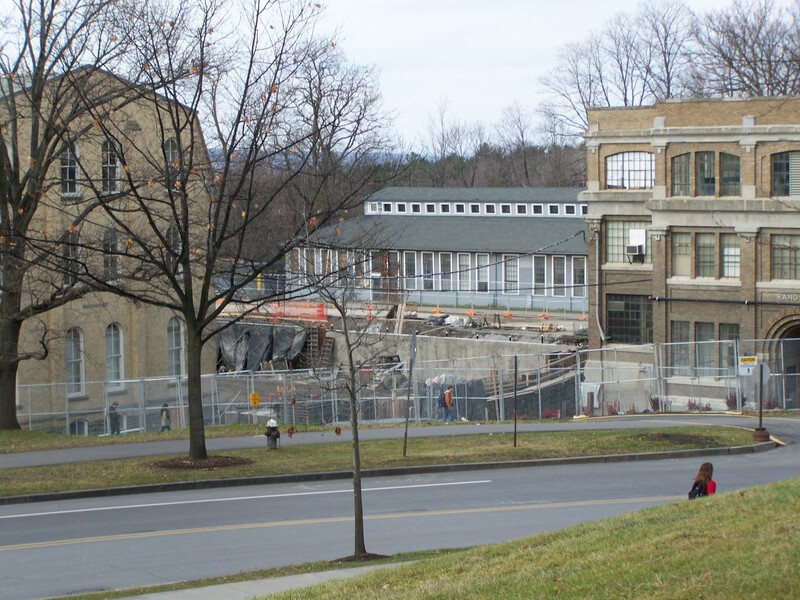 That being said, the architecture of Cornell buildings could be said to be distinctly to the taste of the time period. As Munier pointed out, Romanesque and Collegiate Gothic dominated Cornell’s first 75 or so years, followed by the rapid rise of modernism, in part because it was now en vogue, in part because it was cheap. 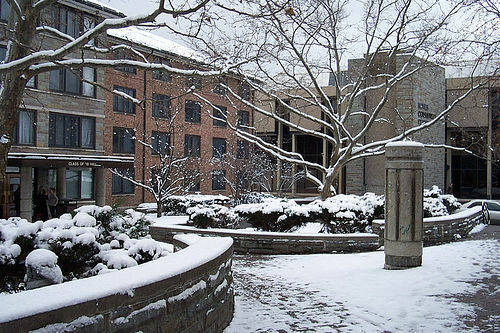 The U-Halls were the sign of things to come (inversely, Teagle Hall could probably be considered the last of the Collegiate Gothic era, as both the U-Halls and Teagle were constructed in the early 1950s). They certainly weren’t attractive, but they weren’t ugly. They were utilitarian, like the Old Stone Row, but with ninety years of technological advancement, design trends and expectations of medicority to fall back on. Don’t get me wrong, Old Noyes, seen on the left of this photo, was a brutalist piece of crap. But it wasn’t built until 1967. 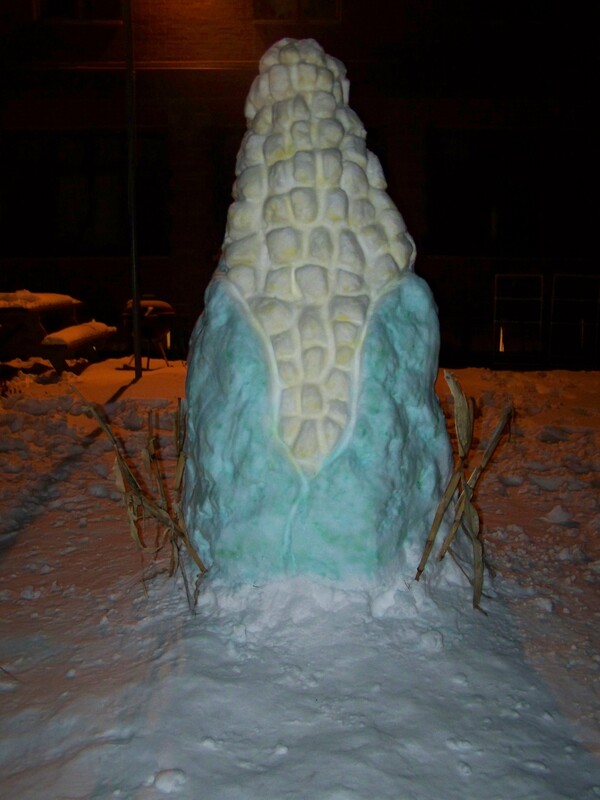 Olin Lab was famed for mediocrity (found elsewhere on this blog). Bradfield grows on you at best, and gives you cataracts at its worst. They were built to the style of the times and on tight budgets, ornamentation and “fine” taste be damned. Much of it has aged terribly, as dated as vinyl clothes. Today, as Munier also pointed out, we live in the era of postmodernism, which at least attempts to blend the taste of older structures with newer engineering and materials. Done right, this turns out to be typical “cake” architecture that, while not anything to write home about, also avoids being offensive. If done really well, such as Princeton’s new Whitman College, it can look as good as the old Gothic (although one could argue about craftsmanship). However, that being said, we live in an era of “Starchitects”. where a name carries more weight than a building. I. M. Pei, Cesar Pelli, Robert A. M. Stern, Sir Norman Foster, Kenzo Tange, the A-list has at least a few dozen architects who could churn out steaming piles and yet because their name is attached to it, it wins renown. Here’s where Rem Koolhaas come into the picture. Designing a building for an architecture school carries with it the expectation of being edgy, avant-garde. So of course, to varying degrees of distaste we have had three edgy designs for Milstein Hall by Steven Holl, Barkow Leibinger and Associates, and Koolhaas. Koolhaas only wins in my book for being boring and unimpressive, versus downright ugly for the other two. Is it a good practice to let Starchitects have free reign? Probably not. 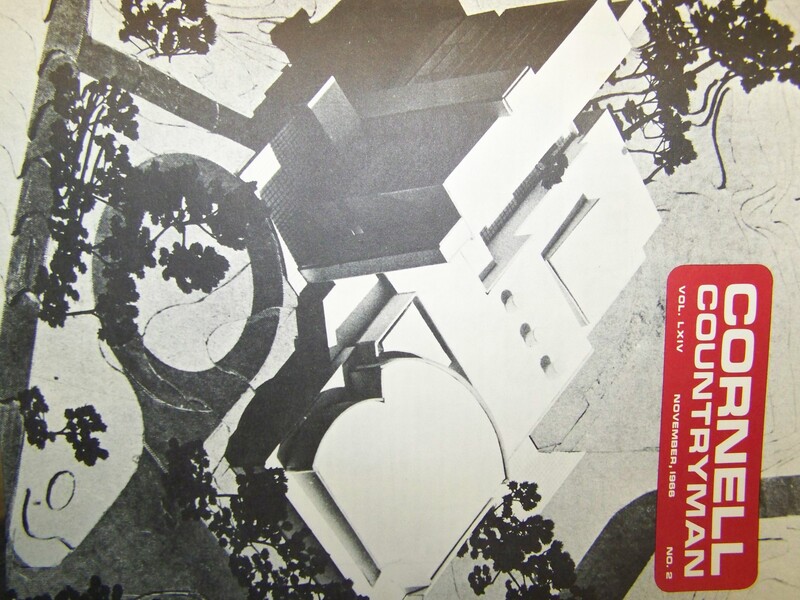 The name has power now, but who now remembers Gordon Bunshaft or Minoru Yamasaki? One designed Lever House in New York City, which hearalded the rise of glass boxes; the other designed the old World Trade Center in New York. It would seem the weight of a name decreases with time. Some people feel that the power of Gothic structures can do wonders for a school’s reputation. I dunno if there’s any truth in that. But if it is, can we please hire this firm? Two things, one dealing with IC and the other with the neighboring South Hill business campus. IC is looking to expand student housing (partially due to the record number of students they enrolled) by adding 280 units of apartment housing to its South Hill campus. Meanwhile, the South Hill Business Campus is seeking approval to construct three buildings totalling 190,000 square feet, which would be built as needed. The business campus was once the regional headquarters of the National Cash Register company (NCR) and was completed in 1957 with an addition in 1975. While it once housed over 1,000 employees, the building was sold to a French company (Axiohm) in 1991, and in a fine showing that they never really cared for local interests, outsourced most of the manufacturing work. By 2004, the factory was only 25% occupied, so a group of investors made an offer to buy the place and operate it as a sort of business incubator for company needing a varying amount of office and maufacturing space. Today, the facility is 84% occupied, so it looks like they did a good job marketing and updating the building. One building would be up by 96B, the second attached to the west end of the current building, and the last just south of the current building. Consideration of a sketch plan for the proposed South Hill Business Campus Master Plan located at 950 Danby Road (NYS Route 96B), Town of Ithaca Tax Parcel No.’s 39-1-1.2 and 39-1-1.1, Planned Development Zone No. 12 and Office Park Commercial Zone. The Master Plan includes the development of three new buildings (totaling +/- 197,000 GSF), a new loop road, additional storm water facilities, and new landscaping. The new buildings would contain a mix of office, manufacturing, and research and development uses, and would be phased in one at a time as needed. South Hill Business Campus LLC, Owner/Applicant; Miles G. Cigolle, A.I.A., HOLT Architects, P.C., Agent. Consideration of a sketch plan for the proposed Circle Apartments Expansion located at 1033 Danby Road (NYS Route 96B), Town of Ithaca Tax Parcel No.’s 43-1-2.2, 43-1-2.3 and 41-1-30.2, Multiple Residence and Medium Density Residential Zones. The project includes the demolition of four existing apartment buildings (32 bedrooms) along with the removal of multiple existing parking spaces on the property to allow for the construction of 78 four bedroom apartment units in nine new buildings (net increase of 280 bedrooms), construction of an approximately 2,500 square foot expansion to the Community Building, and a net addition of 106 parking spaces on the property. The project will also include new storm water facilities, walkways, drives and landscaping. 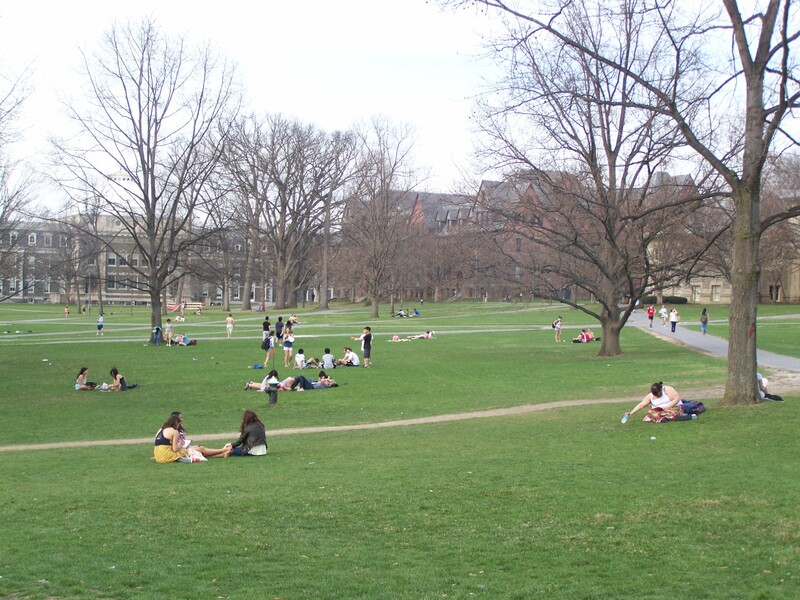 College Circle Associates, LLC and Ithaca College. Owners/Applicants; Herman Sieverding, Integrated Acquisition & Development Corp., Agent. Okay, so not exactly a query as much as it was a link. Someone posted something on Craigslist about downtown Ithaca construction projects, and they linked here, which led a few readers here. Pretty harmless compared to some of the things you find on Craigslist (i.e. disturbing fetishes). The only time I myself have ever used Criaglist was when my housemates and I bought a bunk bed so two people could share the largest bedroom. Guy drove the bed frame out from Cortland in the bed of a pickup truck with no extra charge. Fraternities. Actually, some sororities, such as Kappa Alpha Theta, are also technically fraternities by name. 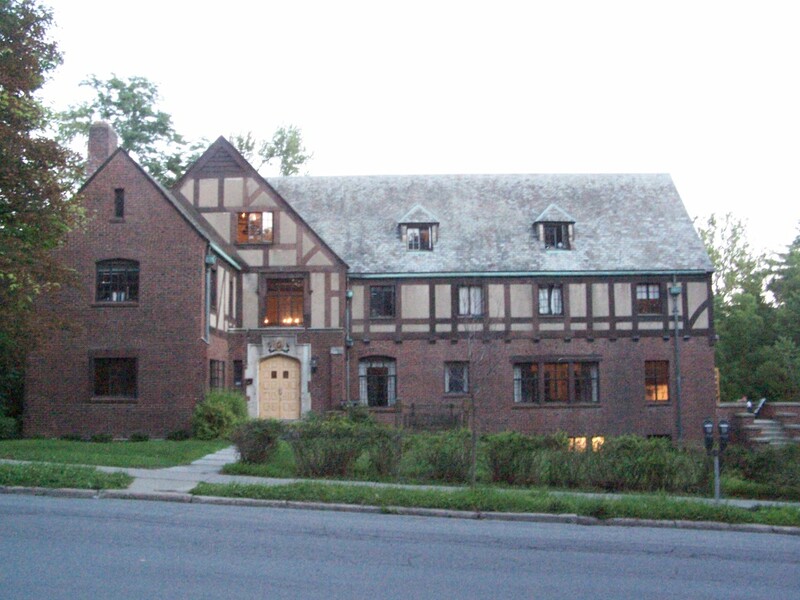 In a nutshell, not all fraternities are all male, but all sororities are all female. Some overstep the confusion by calling themselves “societies” or by vaguely referring to themselves as “organizations”. Probably not. Eleusis was based out of a house at 313 Wait Avenue. The number of houses already in the area by the 1910s, combined with at least some sporadic tress (the area was relatively barren compared to today) would’ve meant that with maybe the slight exception of the rooftop offering hindered views of Beebe Lake pre-Balch Hall, there were no water views from Eleusis. According to the 2009 World Almanac, the highest wind speed is 91 MPH, but in a typical year the highest wind speed is normally around 50 MPH. Coming along nicely. Seems to be on time for its October dedication. Kinda funny how that turned out. It took them well over a year to renovate the old bank building on the SW corner of College and Dryden, and they were only open for a year. I went there on a date once. It was nothing special, although food-by-the-pound was an interesting take on dining out. I s’pose that one of the reasons they applied for a liquor license a few months back was to try and drum up business, but it didn’t work as well as hoped. About as similar as chalk is to cheese. One is difficult, frustrating and has a low average GPA. The other isn’t. ORIE (Operations Reserach and Information Engineering) is sometimes described as a blend of the two. To be honest, I’m not sure. I want to say it opens at 8 AM and is closed by 8 PM, but I’m not positive. Perhaps someone who reads this blog has the answer to that question.